Editor’s note: Since July 2010, the Ann Arbor Transportation Authority has been developing a transit master plan (TMP) for transit service throughout Washtenaw County. Countywide service would represent an expansion of the service it currently offers in Ann Arbor, which is supported by a transit millage. The AATA also offers limited service in the rest of the county through purchase of service agreements (POS) with three of the county’s townships and the city of Ypsilanti. 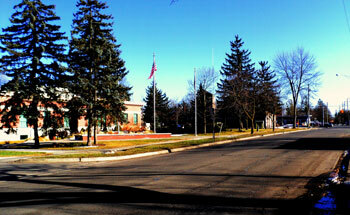 In November 2010, Ypsilanti voters passed a millage to fund its POS agreement with the AATA. A second public engagement phase of the countywide planning exercise is now wrapping up, with 20 community forums held through the month of February at locations across the county. The final four of those forums will take place next week. Coverage of the forum hosted in the Saline area is provided by Chronicle intern and Saline resident Hayley Byrnes. On Feb. 8, at Saline city hall, the Ann Arbor Transportation Authority sponsored the ninth of 20 community forums being held from the end of January through February. Every forum is open to all Washtenaw County residents, but they’re being held at locations across the county – like Saline – to make it easier for people to attend. The goal of a previous round of 20 public forums, held last year, was to get participants to brainstorm about countywide transit. But the current set of forums is all about presenting participants with three specific scenarios that have been developed so far, based in part on those first 20 meetings. 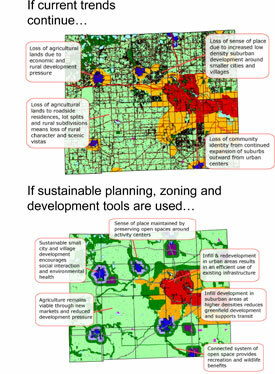 The AATA is calling these three scenarios: Lifeline Plus, Accessible County and Smart Growth. From those three scenarios, a preferred scenario will be developed. An AATA board consensus on that scenario is expected in March, with board action on adoption of a countywide transit plan expected in April. Michael Benham, who’s coordinating the project for the AATA, and Juliet Edmonson, a consultant with Steer Davies Gleave (SDG), hosted the Saline forum. Michael Ford, CEO of the AATA, made an appearance in video form. For county residents who cannot attend any of the forums, the AATA is also seeking feedback on the three scenarios using an online survey. The forum began with a video featuring Michael Ford, AATA’s CEO, describing the advantages of public transportation. Taking public transportation, he said, is “more than getting on a bus.” Alternative and public ways of transit shape our community, he continued. The video also featured various figures in Washtenaw County, including Ann Arbor mayor John Hieftje and Ypsilanti mayor Paul Schreiber. After the brief introduction and video, Michael Benham outlined the objectives for the evening. The primary objective, he said, was to update attendees on the transit master plan (TMP), a project that the AATA has been working on since the summer of 2010. The AATA began the process with more than a hundred meetings last summer, including 20 public forums, asking for input from communities throughout Washtenaw County. In broad strokes, here’s where the project stands: Based on prior public input, the review of existing plans and data, and an assessment of the county’s transportation needs, three possible scenarios have now been developed, out of which one preferred scenario will be constructed. More specifically, MovingYouForward.org, AATA’s website devoted to the development of the countywide master plan, outlines six steps to the process of implementing the plan: (1) visions and objectives; (2) existing conditions and needs; (3) transportation options and scenario development; (4) developing the preferred scenario; (5) transit master plan, (6) and funding and implementation plan. The current round of public meetings is part of step (4). At the January AATA board meeting, board members indicated that they hoped to achieve a consensus on a preferred scenario in March and adoption of a transit master plan in April. Benham paraphrased the website’s timeline, stating that the AATA’s focus now is on honing and revising the newly-created scenarios that emerged from public meetings held last June and July. “We’re not just here to provide buses,” he said, “but buses for your education, for your community involvement.” Again he stressed that the role of the AATA is not simply transportation: it should serve to enhance the entire community. At that point Benham stopped looking at a PowerPoint slide that listed the six stages of the TMP, turned to the audience and told them that feedback was the AATA’s primary concern. He didn’t want to just read off a PowerPoint slide for an hour and a half, he continued. Audience interaction and an informal atmosphere are paramount for the AATA to accurately gather feedback, he concluded, which was the primary purpose of the forum itself. Benham outlined four steps that the AATA took while creating the three scenarios for the TMP: public involvement, he said, was the primary step; the second came with research, particularly of other cities and transit systems; then came studies of other transit options; finally, the AATA took into account input from existing community plans. Out of all that work, three distinct plans emerged, which the AATA is calling: Lifeline Plus, Accessible County, and Smart Growth. The plans are cumulative, meaning that everything included in Lifeline Plus is also included in Accessible County, with the addition of other features. The same can be said for Smart Growth, which builds upon Accessible County. Thus, the most comprehensive and expensive of the plans is Smart Growth, while Lifeline Plus implements the fewest number of changes. The goal of Lifeline Plus is slightly different than the other two plans. Lifeline Plus primarily improves existing services and strengthens countywide connections for seniors. Rather than create new options or methods of transit, it enhances options already available to residents. Accessible County also strengthens existing services, but would build more transit options for areas outside of urban areas. While Lifeline Plus would focus on densely populated areas such as Ann Arbor, Accessible County would have a more countywide perspective and integrate transit more thoroughly in areas such as Dexter and Chelsea. The third plan, Smart Growth, would accomplish the same tasks as Accessible County, though it would possibly integrate rail elements (an element not found in either of the other two plans). Transit would become a permanent feature – it would serve to develop urban infrastructure and connect citizens to all parts of Washtenaw County. Benham deferred to Juliet Edmonson to walk the audience through the scenarios in detail. Edmonson is a consultant with Steer Davies Gleave, which was contracted by the AATA to assist with the development of the countywide planning effort. She’s been living in Ann Arbor since last summer. The first scenario, Lifeline Plus, is the one least different from existing transportation services. While Accessible County expands throughout all of Washtenaw County and Smart Growth aims to reinvent county’s transportation network, Lifeline Plus focuses on strengthening the current transportation options. It would start by enhancing the urban bus network. One key feature of the Lifeline Plus, explained Edmonds, is the expected increase in frequency of buses. More evening and weekend services would be available under the plan. Along with increasing the frequency of services, Edmonson stressed that physical refurbishment and redevelopment of bus infrastructure would occur as well. Under the Lifeline Plus scenario, two existing transit stations would be developed further: the Blake Transit Center hub in Ann Arbor, and a similar one in Ypsilanti. The plan would also include a downtown circulator in Ann Arbor. In connection to circulators, Edmonson mentioned the LINK – an Ann Arbor downtown circulator that used to operate with purple-painted buses, but that was discontinued by the AATA board in August 2009. Under Lifeline Plus, she said, a service similar to the LINK would be restored. Edmonson then relied on a colored map with various symbols to aid her next few points. The map gave a schematic representation of Washtenaw County, highlighting the cities of Chelsea, Dexter, Whitmore Lake, Barton Hills, Ann Arbor, Saline, Ypsilanti, Manchester, and Milan. Each town or city then had certain symbols next to its label – for example, all nine municipalities were tagged with a blue bus symbol, meaning that there would be vehicle improvements to buses across the county under the Lifeline Plus scenario. Transit, Edmonson said, would also not be narrowly understood to include only buses: the Lifeline Plus scenario also includes enhancements for pedestrians and cyclists. Edmonson also indicated that in Ann Arbor there would be special focus on allowing for bus priority over other kinds of traffic. She said a chief goal of public transit is to allow for a reliable and consistent ride. If you are expecting your ride to take 20 minutes, she said, it should take 20 minutes. Further emphasis would be placed on bus stops, including better shelters for the winter and easier sidewalk access. Integrated ticketing, she continued, would also be a priority under this scenario. Rather than penalizing people for using more than one kind of service, she said, the AATA would hope to centralize their ticketing, making it easier for customers to use multiple services. Under the Lifeline Plus scenario, the kind of service offered currently by WAVE (Western Washtenaw Area Value Express), which is operated by a nonprofit, would be enhanced further, with longer operating hours; it would also be expected to integrate Chelsea and Dexter, as part the AATA’s vision for countywide transportation. The People’s Express, a transportation service for seniors, currently providing service in the townships, would also be enhanced to include Canton and Chelsea. While the Lifeline Plus scenario improves existing options in Ann Arbor, the scenario also strengthens local transportation in Chelsea by including a local circulator. A shuttle currently operates in Chelsea, through a partnership with WAVE and the United Methodist Retirement Communities (UMRC). Under the Lifeline Plus scenario, that kind of shuttle would have longer operating hours. On a more Ann Arbor-centric note, Edmonson explained that on the Lifeline Plus scenario, six new intercept park-and-ride lots would be available to commuters into downtown Ann Arbor. Park-and-ride commuters could park in a lot on the outskirts of Ann Arbor and catch a bus into the downtown area. The AATA already has four such park-and-ride lots, including the lot near Plymouth Road and US-23, which was constructed last year specifically as a park-and-ride lot. An airport express shuttle would also be implemented on the Lifeline Plus scenario, making it easier to get to and from the Detroit Metro Airport. On a final countywide note, Edmonson said that two measures would be enhanced and promoted throughout the county: car/vanpools and door-to-door services. While both these services are available currently, Edmonson stressed that they would be even more accessible for everyone within the county under the Lifeline Plus scenario. Edmonson assured the audience that her explanation of Accessible County would not be quite as comprehensive as Lifeline Plus, simply because every single feature included in Lifeline Plus would also be included in Accessible County. The Accessible County scenario would simply build even further on that base. Edmonson dived in to the Accessible County scenario by stressing a countywide express network and local transit hubs. Under this scenario, she said, Manchester, Saline, Milan, and Whitmore Lake would be included in this countywide network. For example, there would be an express service from Milan to Saline, and then to Ann Arbor. There may be another express service that runs through Manchester, then Saline, then finally to Ann Arbor. Faster trips would be an aspect of transportation addressed in Accessible County. In the Lifeline Plus scenario, only Chelsea and Ann Arbor had a local circulator incorporated in the countywide transit plan. But under Accessible County, Chelsea, Dexter, and Saline would all have local circulators. The final aspect of Accessible County not included in Lifeline Plus was a “Flex” ride service available for all residents of Washtenaw County. The Flex Ride would aim to fill in any gaps of other services and would have a personalized approach. The idea, Edmonson said, would be that a resident could call up the AATA and say, “I need to make this trip at this time,” and the AATA would make it work. That may be a door-to-door service, or that may mean sharing a car with more than one person, but the service would be for everyone, she said. The final scenario, Smart Growth, has the goal to “invest in transit across the county to stimulate economic growth and focus on land development in areas that best accommodate growth,” according to an AATA information booklet detailing the three scenarios. As with the second scenario, Smart Growth is cumulative and encompasses all the services offered in Lifeline Plus and Accessible County. A defining feature of the Smart Growth scenario is the investment in regional rail systems, a feature not included in either of the other two scenarios. One rail line, the east-west connection, would run from Ann Arbor to Dearborn and Detroit. A second rail line – the WALLY (Washtenaw Livingston Rail Line) – would be a commuter connection running north-south between Howell and Ann Arbor. Edmonson added that cities like Toledo were not included in the plan, but there is still the potential for those places to be incorporated in the Smart Growth model. When Edmonson described the Plymouth-State connector, one forum attendee asked what would happen to University of Michigan buses running through that area. Benham responded that they would be replaced, at least partially, by something like the Ann Arbor Connector. Benham said this would reduce the currently cramped nature of these buses. “I know,” the attendee responded, “they’re standing room only.” Benham continued that if you want to get to downtown Ann Arbor, congestion clogs many of the roads before you arrive at Main Street. The idea of park-and-ride, he said, is to park on the outskirts – say around Briarwood Mall – and take a straight shot downtown using public transportation. A third attendee brought some local perspective to the discussion. He mentioned the “good efforts” made in Saline in the past to bring about public transportation, but said that such offerings died for a lack of ridership. Do you think, he asked, enough people will support the comprehensive offerings of Smart Growth? Benham again responded in a general way, saying that’s a challenge faced by the AATA whenever they implement new programs. Benham continued by stressing that the AATA is a creature of Ann Arbor – residents pay a transportation millage. Outside of that, however, the AATA has no guaranteed funding. The majority of funding for construction of these scenarios – Lifeline Plus, Accessible County, and Smart Growth – would come from federal grants. But in the past, these services have barely been able to get started before funding runs out. The whole rationale of this master plan, he continued, would be eventually achieve a more stable funding source. The first attendee made a comment that followed up on the idea of transportation local to Saline, emphasizing that these buses can’t just run over by Briarwood or Ypsilanti – they have to come into Saline. Benham continued by acknowledging that the population of Washtenaw County has spread out, but the transportation system has not followed. We must, he said, start providing services for everyone within the county. Benham first highlighted the number of cars estimated to be taken off the road annually: the Lifeline Plus scenario would eliminate 2.9 million car trips, the Accessible County would eliminate 3.3 million, and Smart Growth would eliminate 5.4 million car trips annually. Benham also highlighted the number of new jobs each scenario would create: from 418 for Lifeline Plus to 1,830 for Smart Growth. He then moved to the number of serious road accidents annually – under Smart Growth, a projected 111 serious car accidents are estimated to be prevented per year. Along with that, he continued, there would be an increase in the senior population who are within walking distance to transit. Environmentally, each plan would include a significant reduction in emissions. Benham emphasized that the numbers were conservative, and that perhaps even more businesses would relocate to Ann Arbor just because of Lifeline Plus. The effect, he explained, is indirect. With a stronger public transportation plan, he continued, employees would easily be able to get to and from work. Additionally, the congestion in Ann Arbor would be eased because of the decrease in cars on the road. Even the smoggy atmosphere of Ann Arbor, one forum participant chimed in, would be relieved. As a result of all these positive impacts, Benham concluded, businesses would be more likely to locate near Ann Arbor, thus bringing more success and prosperity to the area. While the Lifeline Plus and Accessible County are similar in capital cost, the Smart Growth scenario is considerably higher, because offers a new dimension of high-capacity transit and regional rail services. But, Benham pointed out, not all of those costs would be paid by Washtenaw County taxpayers alone. In the case of the rail options included in Smart Growth, roughly two-thirds of the track would be located in Wayne County. We want to emphasize cost, Benham said, not funding. Benham then introduced a pie chart indicating various sources of funding. Historically, the federal government has paid for 45% of the funding; the state has paid another 13%; local sources contribute 16%; and the final 26% is generated directly through fares. Benham cited the Millennium Park project in Chicago as a model for how funds could be broken down to minimize the expense on the taxpayer – in that example, the project cost half a billion dollars. Yet one-third of that came from private sources. Edmonson added that individuals, institutions, and corporations all have an incentive to contribute. Benham then returned to the local scenarios, saying that one-third of the operating costs would be shouldered by local residents. The total operating cost divided into a scenario’s total community benefits makes up that scenario’s cost-benefit ratio. The Smart Growth scenario has the highest cost-benefit ratio, of 3.12 – that is, for every $1 of additional operating cost, the community receives an additional $3.12 of benefit. Lifeline Plus has a 2.6 cost-benefit ratio, while Accessible County’s is a near-identical 2.62. But the AATA, he said, cannot do this alone. In every one of the scenarios – as well as for its current operations – the AATA has “strategic alliances” with WAVE, People’s Express, and Manchester Senior Services, Benham said. He underlined that the term “transportation” need not be limited to buses and railways. The AATA also seeks to expand bikeways and sidewalks, along with roadways. One forum attendee, who had not spoken until that point, added that they’d seen how a person in a wheelchair had not been accommodated on a bus on South University Avenue. Another forum attendee pointed out the need for additional bike racks or some similar device to allow cyclists to use buses. Benham responded by saying that currently buses do allow for bikes to be attached to front-mounted racks, but sometimes space is limited. “We are victims of our own success.” Safety is the top priority, and the possibility of hooking bikes to the back of buses – as the citizen was suggesting – allowed for a potential danger of theft. We can’t, he stressed, create situations that are potentially unsafe. Switching gears, Benham pointed out that if the current trends continue, development will be everywhere. But if planning tools are used, space can remain open. Benham then showed a slide illustrating the projected impact on land use in the county, with and without investments in transit and other development tools. Without transit investments, the slide showed a continued loss of open space and agricultural land and a decrease in sense of place. Benham then used a transit center in Tempe, Ariz. to illustrate the potential of transit hubs. The Arizona center is a multi-use green facility that serves as a center for the entire community. It includes a bike station and even showers – it became more than a transit stop. As his PowerPoint presentation came to an end, Benham said again that community input is vital. What do you, as residents, want the future to be like? With that, two forum attendees shared their own experiences with transit. The first was a woman from Chelsea who helped establish the local circulator that runs through town. While the circulator began strictly for those in Chelsea’s United Methodist Retirement Communities (UMRC), she emphasized that it is hard for nonprofits to get funding. Eventually, they collaborated with the WAVE. She emphasized that even a simple circulator helps seniors maintain their independence. Saline, she added, also needs something like that. The second resident has a son with a developmental disability, and emphasized that public transportation is crucial. Especially from Saline to Ann Arbor, she said, we need countywide transportation. AATA has done an excellent job of seeking input and providing opportunities for interaction. Despite some complaints about service at a previous meeting, I have found it to be the exception rather than the rule when service was not acceptable. I think the drivers do an outstanding job working with the general public and trying to keep us safe. For Lifeline Plus and Accessible County, the difference of 3 million is relatively small. Based on the presented national averages, the local cost contribution of 16% for either of these is roughly 8 million dollars while the Smart Growth would be on the order of 80 million. Can anyone tell us what Ann Arbor currently contributes/funds to AATA? As much as I would love to see and support (yes, even pay more myself to continue to use AATA services), Washtenaw County is looking at a $20 million deficit…are any surrounding counties doing well enough to contribute? Is there private sector support for this kind of price tag? The roughly 2 mill transportation tax currently levied by the city of Ann Arbor generates about $9 million annually. And to expand on that, Washtenaw County government and citizens outside of Washtenaw County do not pay anything for support of AATA, except for the POSA (purchase of service agreements) whereby some areas pay for specific routes. This is a city service bidding to become a regional/county service. If they succeed in a county-wide millage vote, they can become a county-wide service. But the Smart Growth scenario depends on a lavish future Federal and State funding as well. With the current national and state budget and political environments, that seems dubious. How can the organizers possibly compare Millenium Park (a community-based open space amenity) to a transit proposal? The likelihood of private donations is surely minimal. Sorry, I meant to say “citizens outside of Ann Arbor” in the first sentence.